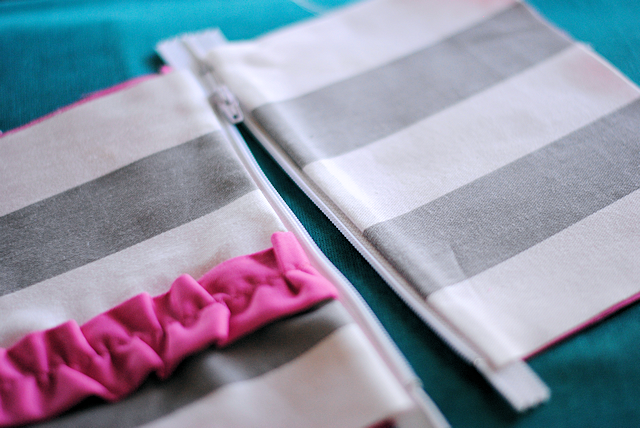 They are both pretty quick and easy to make and you can make them to match your bag! Or make them as a gift to give to a friend. Let’s start with the zipper pouch and then they key fobs will be below that. Cut out your fabric. 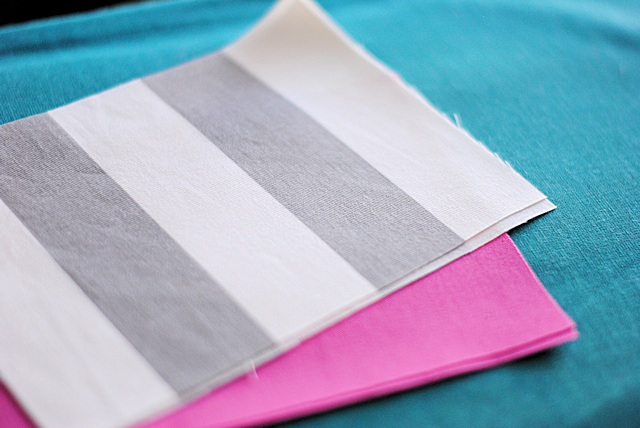 You will need 2 pieces each of 2 different fabrics for a total of 4 pieces. Each piece should be 7 1/2″ wide by 5 1/2″ tall. Now we will begin to put the bag together. Grab one of your outer pieces and one of our inner. Place the fabrics together with right sides together and the zipper sandwiched between them along the top edge with the right side of the zipper touching the right side of your outer fabric. 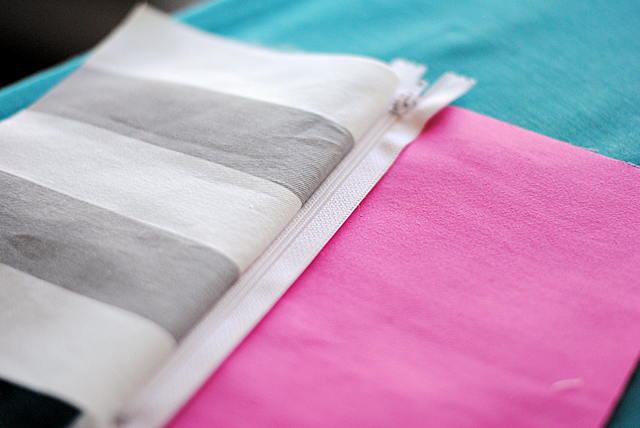 Now do that with your other two fabrics and the other side of the zipper. You will sew right through the ruffle and there will be excess hanging off. Just cut that end off AFTER you sew this step. Top stitch along the zipper on both sides of the zipper. 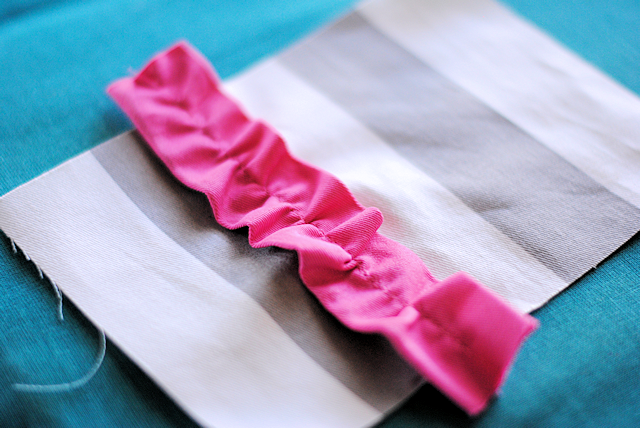 Trim off any excess zipper or ruffle and turn it all right side out. 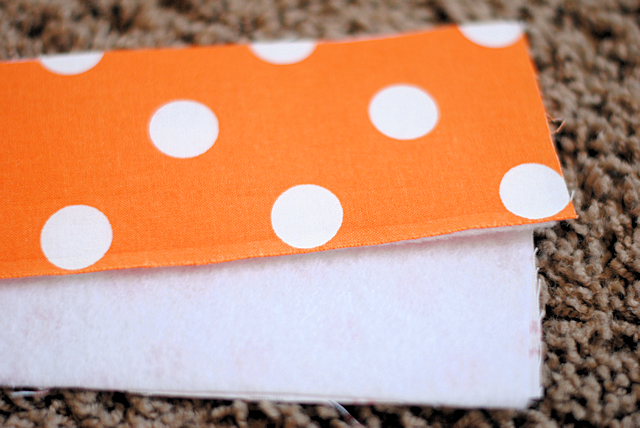 Poke out the corners to get them nice and crisp and stitch your opening shut. Press is all nicely again and you’re done! 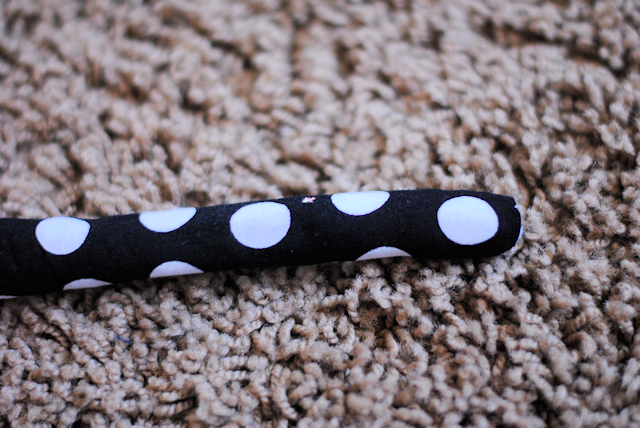 This is perfect for carrying things like keys, credit cards, pens, even your phone. 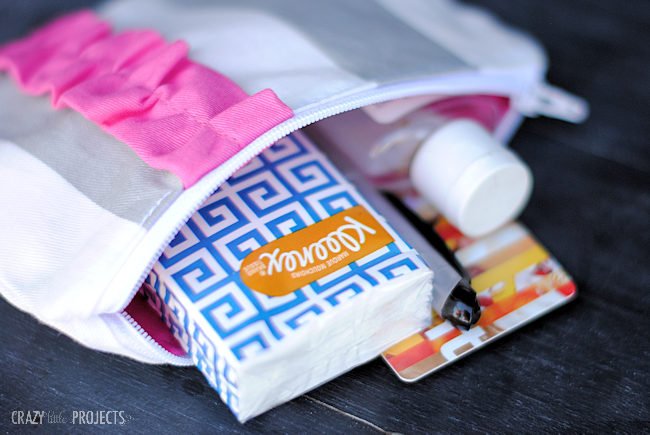 It’s also perfect for carrying a small package of Kleenex! These new Kleenex designs are really nice aren’t they? I love the bright, bold designs! Guess what?! 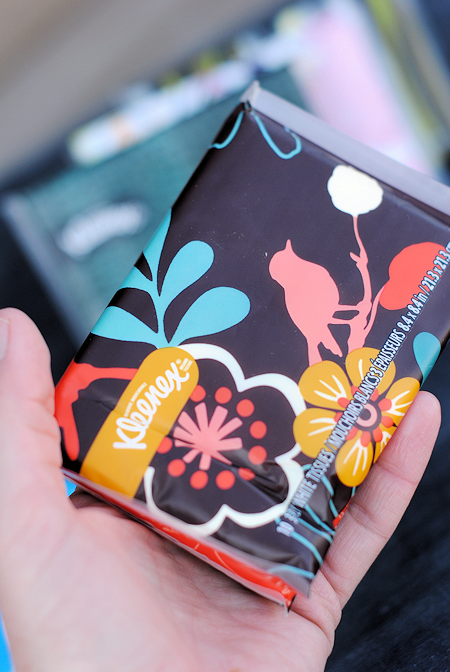 Kleenex has a whole new line of beautiful designs for all of their packaging. 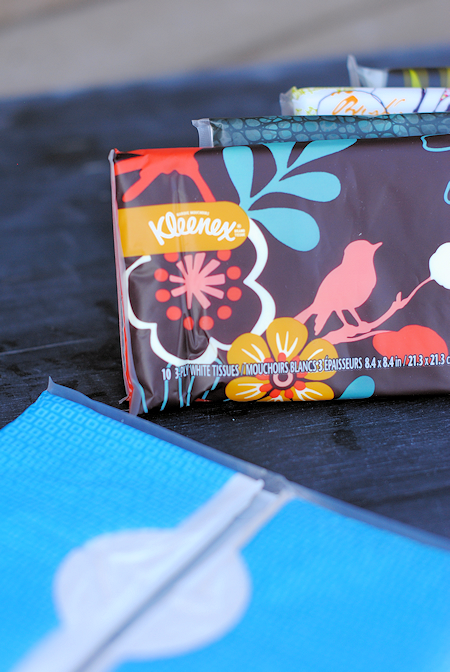 Go to Kleenex’s website and take the Style Quiz! It’s not only fun, you get a coupon when you are done! Tell me which of the new packaging options is your favorite! Comment below. I loved the Green and Blue geometric designs in the image above. Which is your favorite? OK, now after you visit Kleenex, let’s try the key fobs. These really are so easy to make! 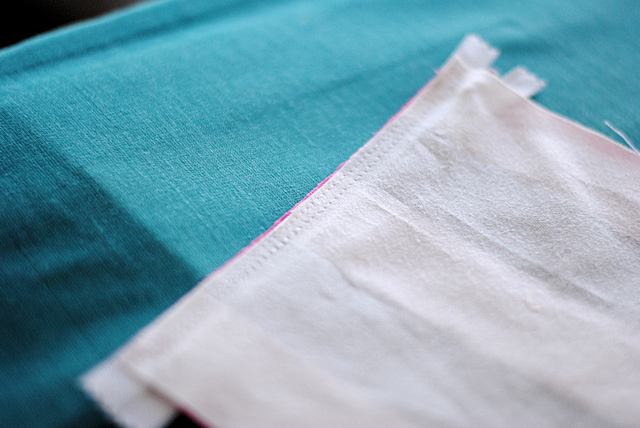 First, cut your fabric out. I can’t tell you exactly what size to cut it, because it will depend on the size of hardware that you got. Mine is 1 inch wide. 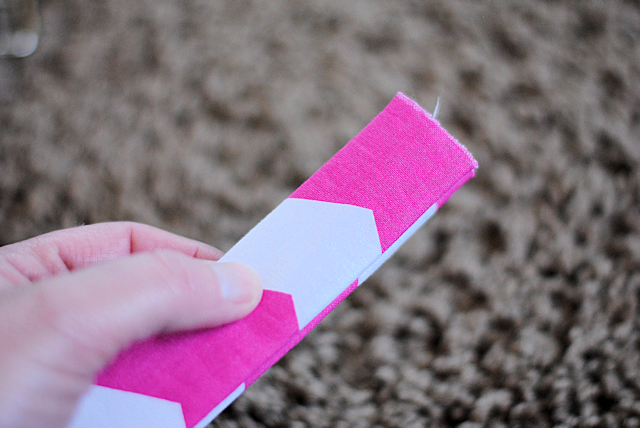 So I cut my fabric strip 2 3/4″ wide by 12″ long. This gives me enough fabric to fold it in half and it together. 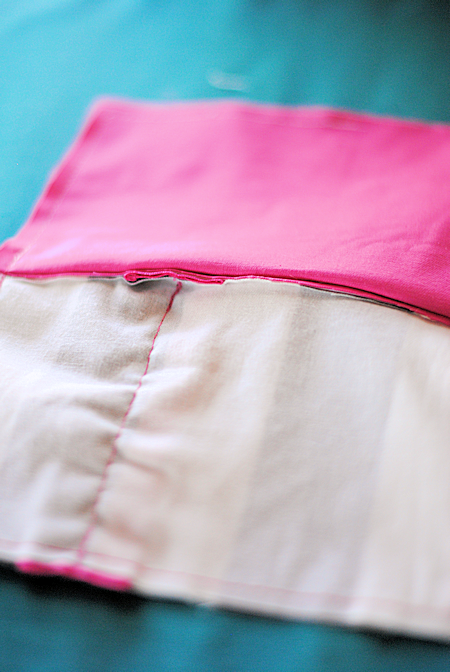 With the seam allowance (3/8″) that should make it end up 1 inch wide after it is sewn. 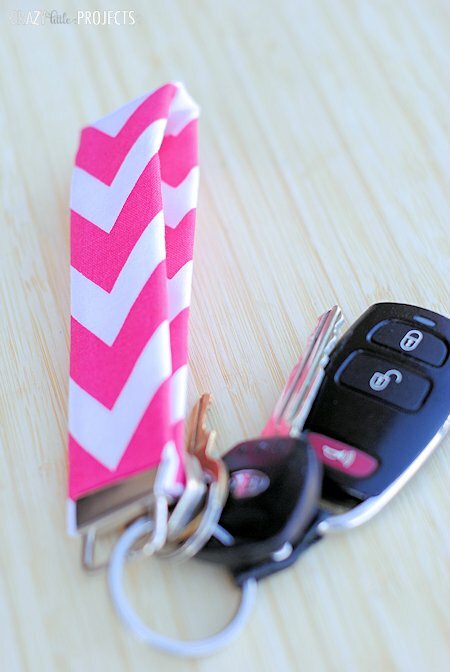 Calculate this for the width of your key fob and then cut out your fabric. Have fun! 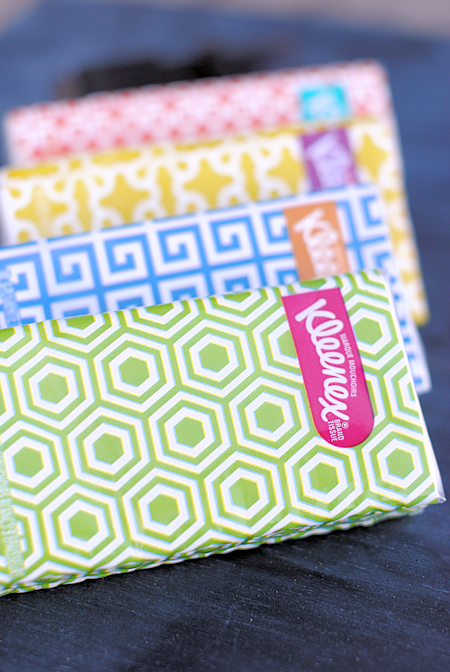 And don’t forget to tell me which design you like best at Kleenex! I might have to try that one day. Who doesn’t need a bag for makeup? Looks so simple. I am a simple sewer. im a beginner sewer too diane and i can make those zipper pouches in 12minutes beginning to end – they are super popular! I am so going to make these to go with my new purse. For the Kleenex I liked several, but my favorite has to be Stop and Smell the Roses. I love the flower motifs. I am never without those mini Kleenex. Never!! Love your tutorials. Thanks for sharing. I love these little projects. I am going to start making some little gifts for Christmas . Thank you ! loved your new project you have shared with us. I tried to go to the kleenex site and take the quiz but I wasn’t able to find the quiz? I like the Blossom pocket pack. Thanks for the tutorials. What a cute project! Pinning! 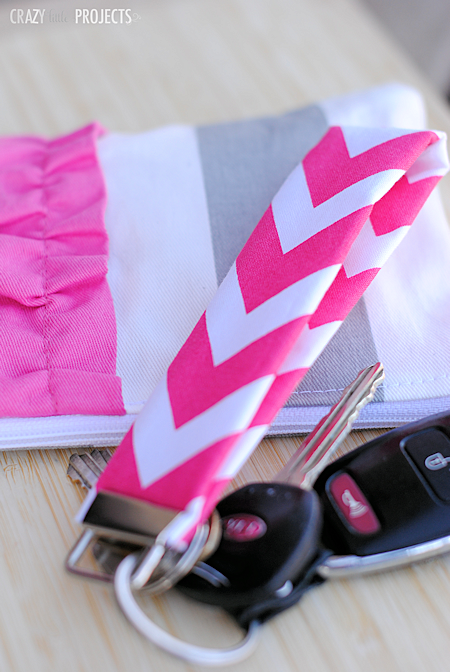 Love the idea of making a key fob and the zipper pouch is too cute! Some other readers have said the sMe thing-that you’ve got to get them online. Maybe buy a bunch and make them as gifts? I just ordered some of the hardware thru a shop on Etsy.com . Can’t remember the shop name right now but if you go to Etsy and Google key chains or key chain hardware it should come right up. Fast shipping and different sizes offered too. Wow..you are right. There are lots on etsy. I was going to make teacher gifts for end of year. Now I’ll shoot for Christmas. Thanks..
Look in the section where the jewelry making supplies are. Also try Joann Fabrics. Amazon has them. Just put in a search for key fobs clasps. I ordered some and got them in about 3 days. CUTE and easy tutorials!! My fav pattern is Pop Goes The Color. Too cute! Can you explain better, once you have sew the zipper on both sides, which sizes need to be sewn to what? And how to then turn it all inside out? I am so confused. 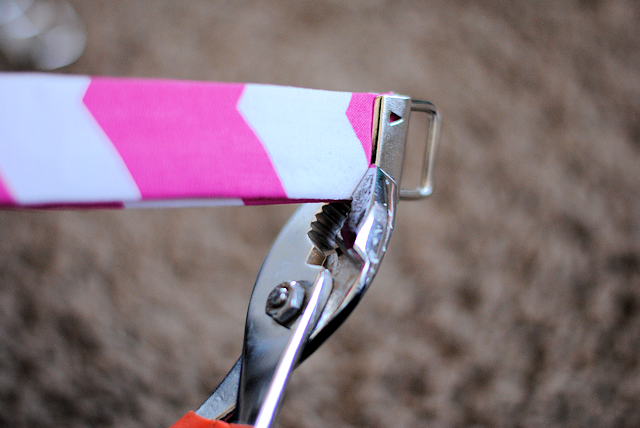 Use scissors or a chopstick to push it through and have pliers handy to pull as needed. 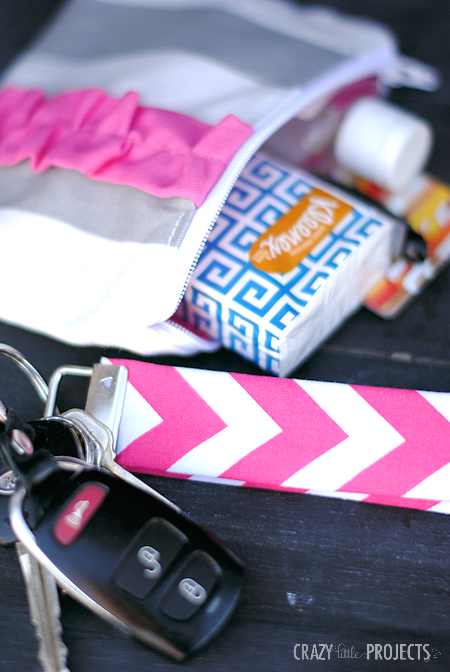 Thank You for sharing the directions for the key fob & zippered pouch. These will make great little inexpensive, yet useful gifts, for almost any occasion. What type of fabric do you recommend for a semi-stout key fob? I know you can use really any fabric but am curious if you need a stout fabric or if the fuseable fleece takes care of that. Definitely try a duck cloth/canvas if you want it extra sturdy. I’m so frustrated! I’ve been trying for a solid 2 hours now to pull my key fob fabric right side out and I’ve had no success (I have destroyed the fabric though). Any other tips? Maybe a tutorial? Are you using something long and skinny to help push it? A chopstick, your scissors? For super small projects I attach a safety pin with a string and pull it through. 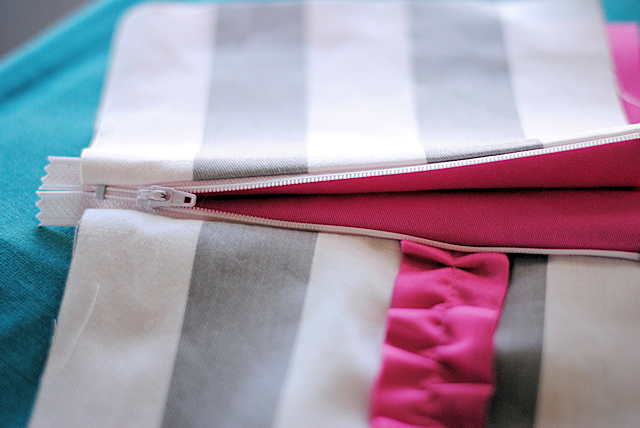 I just made the zipper pouch and love it. I wish I could attach a photo of it for you. This was my first-ever zipper project! I’ve made other projects you’ve posted and have to say your tutorials and directions are great (sometimes it doesn’t click in my brain until I’m actually doing the project, but your directions have always gotten me thru the project.) Thanks so much! Why not just make the end with a small opening to put a key ring Through it? I tried the key fob. Went out and bought the key fob part….$4.00 for 5 of them. Made 2 and even though I am a very strong person, I could not flatten the part that attaches to the fabric enough to keep the fabric from pulling out. 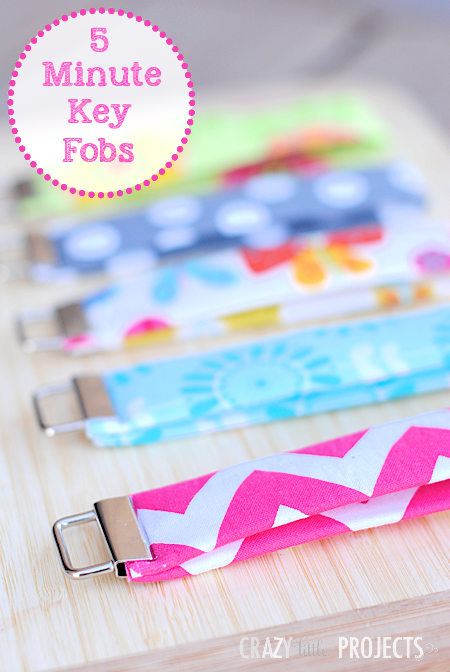 So wasted 2 key fobs because once you put them on you cannot take them off and reuse. I really wanted to like this project and give them as Christmas gifts, but can’t keep buying the metal parts and having them fail. I know this is not your fault, but wondering if you have any hints? I’m not understanding what went wrong?